Watched by Capt. Pat Flynn, firefighter Dave Martin descends from a window using the new bailout system during a training drill. In the firefighting service it is known as “Black Sunday,” an infamous day when three New York City firefighters died while battling two separate blazes. During one of those fires on Jan. 23, 2005, six firefighters were forced to desperately jump from the windows of a Bronx apartment building from four stories up to avoid being burned to death. Two of them died in the fall, while the other four were severely injured. The tragedy underscored the need for a lifesaving system allowing firefighters to escape the flames by using ropes and hooks to safely lower themselves to the ground from a window. 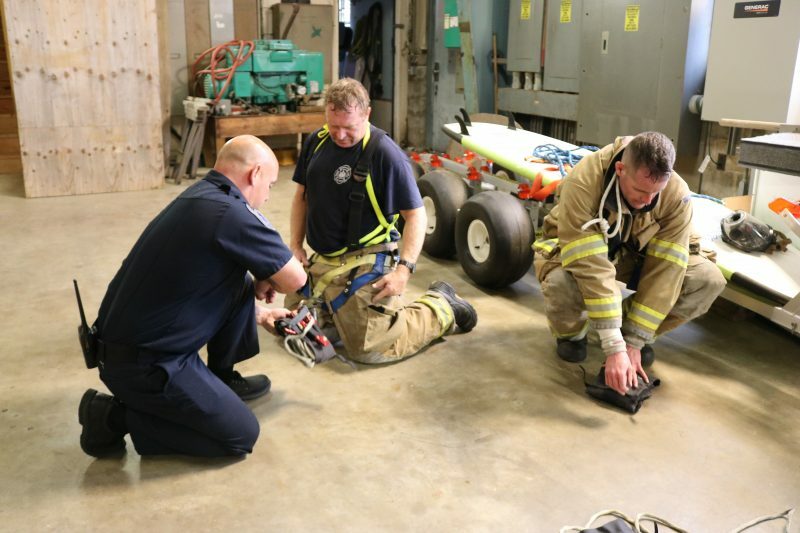 Now, Ocean City has become the first fire department in New Jersey to have such a “bailout system” developed by California-based CMC Rescue Inc. Costing $465 apiece, the personal lifesaving kits will be carried by all 63 members of the department, Capt. Ray Clark said. “If we get trapped or in trouble, this will allow us to escape a burning building,” said Clark, who is in charge of the fire department’s training. Capt. Ray Clark, left, who is in charge of the fire department’s training, checks Dave Martin’s safety gear. Using mockups of a window in a typical Ocean City home or building, firefighters have begun training on the bailout kits at the firehouse on 45th Street. “This is the time to make mistakes, ask questions and become more proficient,” Clark said of the importance of training. The lifesaving system, consisting of a rope, a hook and a “descender” device, is reminiscent of the way a rock climber rappels down the side of a mountain or cliff. It includes a sharp, reinforced metal hook that can be quickly attached to a window sill, a wall, a piece of pipe or even some furniture. 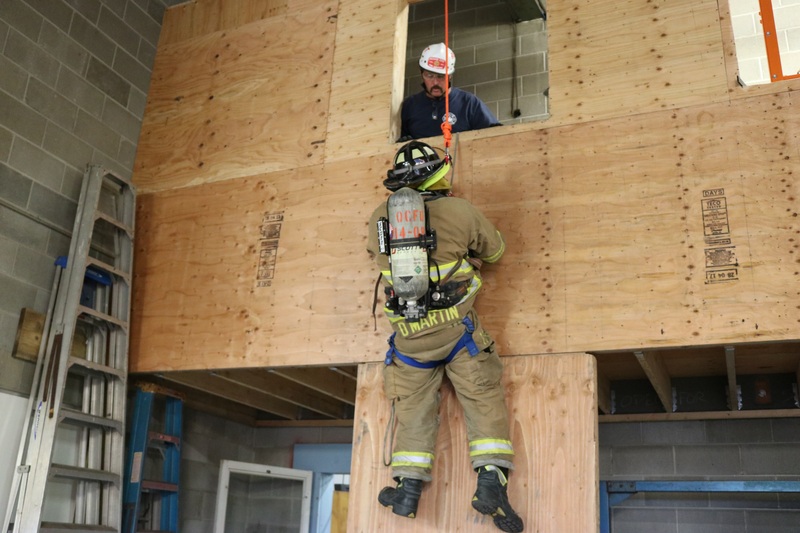 With the hook serving as an anchor, firefighters can jump out of a window and safely lower themselves to another floor or the ground by using the rope and descender device. “It’s one of the best devices we’ve ever bought for safety alone,” Ocean City Fire Capt. Brent Meisenhelter said. Contained in a small pouch that is easy for firefighters to carry, the escape system has a hook that weighs a mere 5.6 ounces and a rope that weighs less than 2 pounds. From left, Capt. Brent Meisenhelter, Capt. Alex Oves and firefighter Ryan Schraff familiarize themselves with the new bailout system gear. 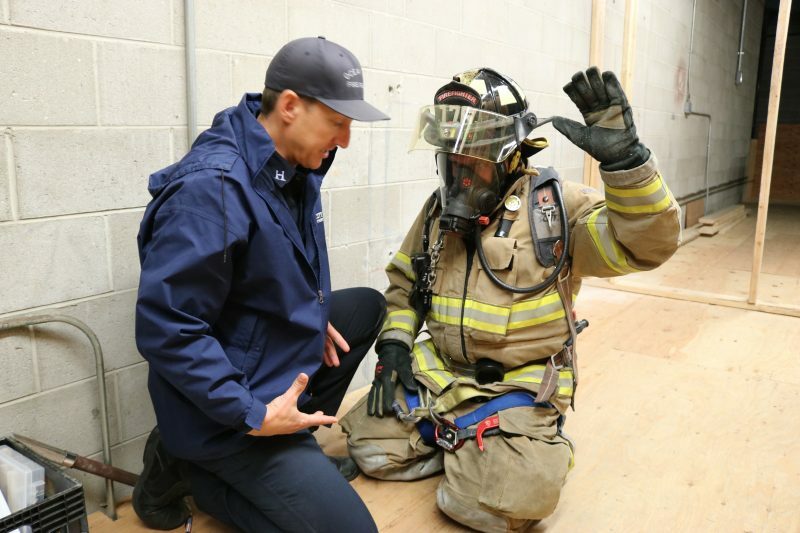 Clark explained that the new CMC system used by Ocean City firefighters has no moving parts, which sets it apart from 95 percent of other personal escape systems on the market. Moving parts are susceptible to corrosion, a major consideration in Ocean City’s salty air, he added. 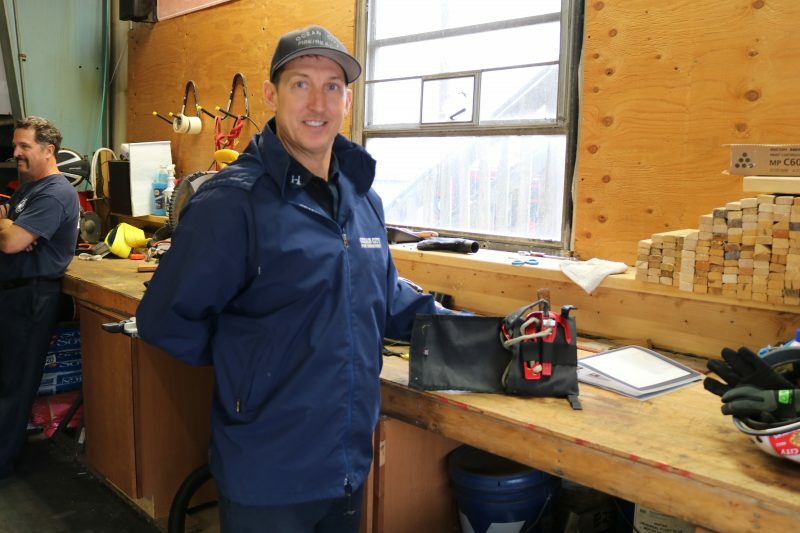 Dave Martin, one of the firefighters who have been training on the new bailout system, described it as a great improvement compared to the basic series of ropes that firefighters once depended on to escape burning buildings. “This is definitely easier. It’s all put together. It’s all preassembled,” Martin said while pointing to the pants pocket where he keeps the compact bailout gear. During a training exercise, Martin’s face was covered with a cloth to mimic the blinding conditions in a smoky building. To escape the simulated burning building, he anchored his metal hook to a wall, then crawled out of the window head first. Once he was outside the window, Martin swung his body around to lower himself down to the ground feet first, using the rope and descender device to control his escape from the building. A safety line was attached to him as part of the training exercise. “I can save people with this,” Martin said, noting that the bailout system could also be used to rescue fire victims. In the 125-year history of the Ocean City Fire Department, no local firefighter has ever died in a fire, Clark said. The new bailout system is another crucial piece of equipment to keep that safety record intact, he stressed. “In the fire service, everything that is bought for us is to help us do our jobs and to rescue people. The bailout system is something so that we can help ourselves,” Clark said. Capt. Ray Clark displays the compact lifesaving system that is stored in a small pouch carried by firefighters.